It’s that time. It may be the holidays, or a break from school, or just any time when there is more going on in your home than usual. It’s easy for you to feel stressed out, or even burned out if the demands are overwhelming. And you know your child will struggle. Have you wondered what a highly sensitive child needs? 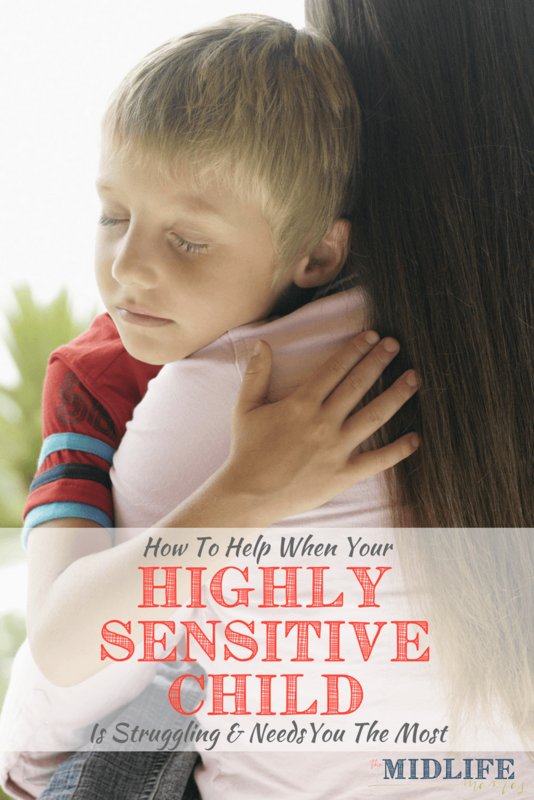 Wondered if you have a highly sensitive child? I’ve definitely been there and my highly sensitive child definitely needs special support from me during these unique and transitional times. Any time when there is more than usual going on – lots of visitors, unfamiliar noises, sounds or smells, family, crowds, parties, or school breaks – a sensitive child might feel utterly overwhelmed. You might even feel like you want to pull your hair out. It’s stressful, busy, overfilled with activity, nerve-wracking and hectic – and that’s just for you! It’s even harder for highly sensitive children. Here’s the one thing I’ve learned to help prevent a meltdown before the world overwhelms sensitive children. Highly sensitive children can be so easily overwhelmed, overstimulated, and just plain freaked out. Sometimes there’s so much going on, it takes all you can do to hold it together. It’s precisely during these times when your child probably can’t hold it all together. Maybe your sensitive child becomes more defiant, argumentative, or just downright uncooperative? Here are a few examples of how you can put what I’ve learned into practice right now, right here, today. Finally, I’ll tell you how all these examples are bound together so that you can put this one simple idea into practice in any situation! All children thrive on consistency and routine. It allows them to feel in control of what’s going on around them. During times filled with unusual, albeit exciting, activities, it becomes even more important to give your sensitive child a routine that they can count on. For example, try to maintain a consistent sleep schedule and daily routine as much as you possibly can. When you can’t stay on your routine, a sensitive child appreciates a warning that things will change for a period of time. And they may need several reminders of each change in routine. So this means for each transition, you will want to remind your sensitive child of what is coming up. When you know routines have to change, sensitive children appreciate consistency in as many other things. For example, if you’re having family photos taken and there are a lot of family members there, a new place for the photo session, high expectations for “compliant” behavior, and other stressors – try to dress your chid in familiar clothes that they like and feel comfortable in. Make sure you bring a snack for your child. Schedule some “down time” for your child during the event. Many times it helps to have a signal with your sensitive child – perhaps asking if they need to go to the restroom – so that they know they will be able to have a break. All of these things will help the sensitive child stay grounded. We all have behavioral expectations of our children. In order for children to meet age appropriate expectations, they need both an immune system that is keeping them healthy and a nervous system that is functioning optimally. Children need nutrient dense foods to maintain optimal functioning of all of their systems – including their immune and nervous systems. During stressful or busy times, their immune and nervous systems can become vulnerable. Any significant changes in what children, especially sensitive children, are eating can cause havoc on behavior. Especially when there’s a lot going on, do your best to limit your child’s intake or sugar and processed foods. It takes a village. But your village can’t help you if they don’t know what you’re dealing with. Let your family and friends know anything special that you want to adhere to for your child. For example, at bedtime, it’s easy to be thwarted by a well meaning friend who says “Let her stay up just a little longer! She’s having so much fun!” What they may not know is that your whole family may pay the price tomorrow. Make sure that family and friends know ahead of time your bedtime plan – or whatever plan it is that you’d like to adhere to for your child. Sometimes a sensitive child may want to open holiday or birthday presents throughout the day – or if there are too many – the next day. Maybe your child likes to take his time with his gifts, my oldest certainly does. Make sure that he feels safe in doing that – that he won’t be rushed or maligned. Planning ahead helps your village support you and it helps you provide the support that your sensitive child needs. While you’re planning ahead – think of yourself and do everything you can to reduce the expectations that you place on yourself. A stressed out mom makes for a stressed out highly sensitive child! At any time when you may be performing specific acts of kindness, know that this may be hard for a highly sensitive child and plan ways that you can help and encourage him, while still leaving plenty of time to complete the project. Nature has a natural calming and grounding effect on us all. When times are really busy, your sensitive child can be grounded by any simple activity in nature. Take a walk, go to a park or a playground, play a game in the backyard together, or collect found objects. One of my favorite simple activities is to make a bracelet of 2″ masking tape with the sticky side facing outward. As you walk, your child can stick all of the items she collects right onto her bracelet! Or have a “hearing treasure hunt.” Being quiet – see how many things you can “find” with your ears…the rustle of the leaves, the chirp of a bird – so much is there waiting to be focused on! Nature organically puts your senses to work – sight, smell, sound, and touch. I think it’s the combination of outdoor air and putting all of your senses to use that makes being outside so calming. Related Post You May Also Like: A Hobby Your Children Will Love – Promise! The one thing that all children, but especially sensitive children, need the very most is you. Make sure that you schedule and carry through with one on one time with your sensitive child. We all love to do activities that we are drawn to – but your child most appreciates your willingness to enter into her world. So set aside some time to read a book, cuddle, build, play dress up or have a tea party with your child if that’s what they love. It’s important that your sensitive child understands that you value time when you have one another’s undivided attention. So I promised you a common thread. But what is it? 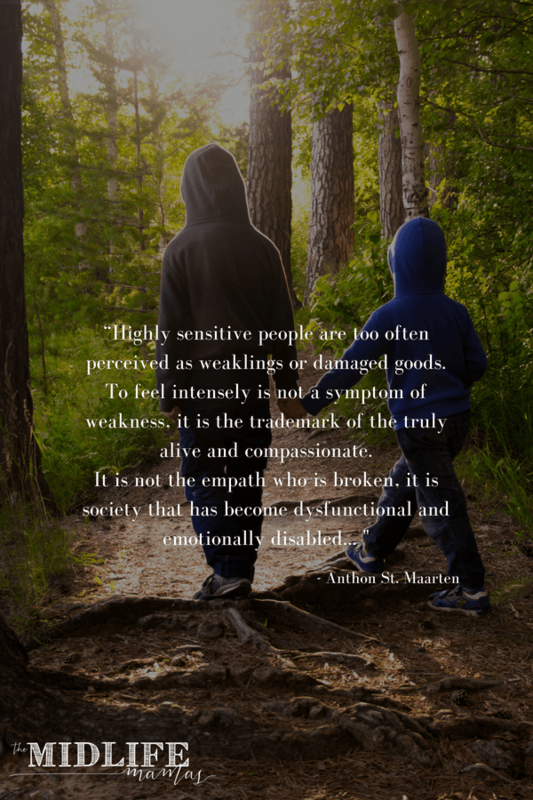 Somebody told me once or I read somewhere (I can’t remember, otherwise I’d tell you…) that if you have high expectations of your sensitive child – there are two potential outcomes. First, if you set high expectations yet offer little support to help your child reach those expectations, your child will fail and feel like a failure. BUT, if you set attainable, but high, expectations (as you should) and offer an equally high level of support, your sensitive child will get through those irregular, crazy, busy times with both success and a positive self image! I’m always careful to make sure that I don’t set expectations beyond reach. If your sensitive child has had a busy day, outside his normal routine, or he has had little “down” time – it might not be reasonable to expect him to go out to dinner. 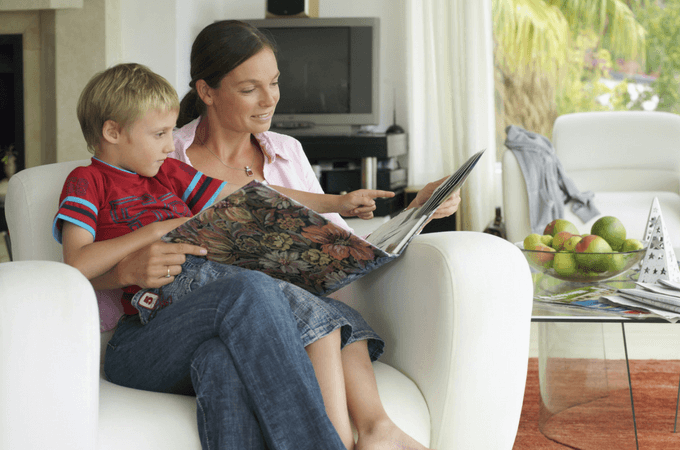 Your highly sensitive child may need some down time before he can meet your expectations. You know your sensitive child best! That’s what you’re going for; what a highly sensitive child needs the most is a lot of support from you at the right time! Your support can help them meet your expectations during times when we all can become stressed out and overwhelmed. Nature! Yes… of course I”m speaking of myself but it also works for my children. There is something so calming about the peace I find out in the woods…. definitely something I need more of this time of year. I really believe that it works for all of us to relieve stress and ground us! Happy holidays! This is sooo true & wonderful advice. My child suffers from “SELECTIVE MUTISM” which is a social anxiety disorder. My childs anxiety is with adults. Was diagnosed from a pediatric neurologist and also sees a therapist. Plus with medication has made many gains, but still has issues. But with time and patience’s and LOVE you can get your child through this! I know this is the real thing we live it everyday. I’m curious if anyone else out there has had their child diagnosed with Selective mutism?thank you for your time! These things are definitely so heartbreaking to watch as a parent, but you sound like an amazing mother! And, yes! It is so hard to always remember that their brains may be working differently – it isn’t always defiance! Thank you for your comment!